It has been suggested that a single operating suction dredge may not pose a problem but the operation of multiple dredges would produce a cumulative effect that could cause harm to aquatic organisms. However, “No additive effects were detected on the Yuba River from 40 active dredges on a 6.8 mile (11 km) stretch. The area most impacted was from the dredge to about 98 feet (30 meters) downstream, for most turbidity and settelable solids (Harvey, B.C., K. McCleneghan, J.D. Linn, and C.L. Langley, 1982). In another study, “Six small dredges (<6 inch dredge nozzle) on a 1.2 mile (2 km) stretch had no additive effect (Harvey, B.C., 1986). Water quality was typically temporally and spatially restricted to the time and immediate vicinity of the dredge (North, P.A., 1993). The California Department of Fish and Game stated in its Draft Environmental Impact Report that “Department regulations do not currently limit dredger densities but the activity itself is somewhat self-regulating. Suction dredge operators must space themselves apart from each other to avoid working in the turbidity plume of the next operator working upstream. Suction Dredging requires relatively clear water to successfully harvest gold ” (CDFG, 1997). Samples were collected on a grid extending downstream from the dredges as they were operating and compared to measurements made upstream of the dredges. One dredge had a 10-inch diameter intake hose and was working relatively fine sediments on a smooth but fast section of the river. 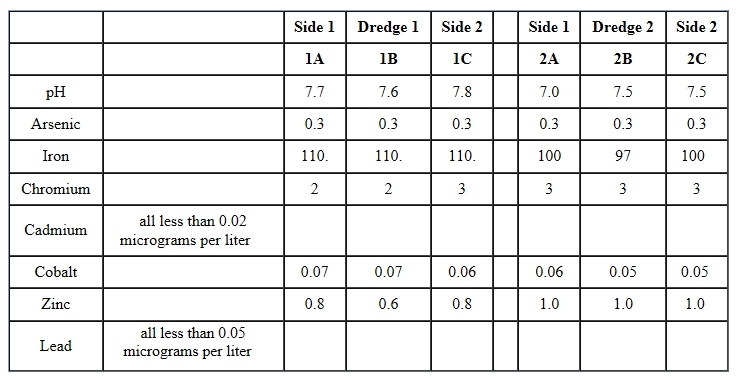 The results of the turbidity survey for the 10-inch dredge are shown on figure 2. 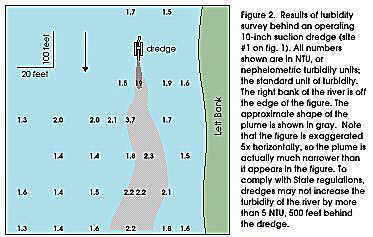 Turbidity values behind the 8-inch dredge were lower, because the smaller intake was moving less sediment material, and because the coarser sediments being worked by the 8-inch dredge settled more rapidly. Concern has been raised that small-scale dredge operations may increase the metal load of the surface waters. Whereas dredge operations do re-suspend the bottom sediment, the magnitude of this disturbance on stream metal loading was unknown. It was unknown what affect the dredge operations may have on the transport and redistribution of metals-some of which (for example, arsenic, copper, and zinc) have environmental importance. In 2000, EPA and California’s Division of Toxic Substance Control worked in concert with other State and local agencies to find the regulatory flexibility needed to collect mercury in a simple and effective manner. In August and September, 2000 the first mercury “milk runs” collected 230 pounds of mercury. A Nevada County household waste collection event held in September 2000 collected about 10 pounds of mercury. The total amount of mercury collected was equivalent to the mercury load in 47 years worth of wastewater discharge from the city of Sacramento’s sewage treatment plant or the mercury in a million mercury thermometers. This successful pilot program demonstrates how recreational gold miners and government agencies can work together to protect the environment (US EPA, 2001). Mercury occurs in several different geochemical forms, including elemental mercury, ionic (or oxidized) mercury, and a suite of organic forms, the most important of which is methylmercury. Methylmercury is the form most readily incorporated into biological tissues and is most toxic to humans. The process of mercury removal by suction dredging does not contaminate the environment because small-scale suction dredging removes elemental mercury. Removal of elemental mercury before it can be converted, by bacteria, to methylmercury is a very important component of environmental and human health protection provided as a secondary benefit of suction dredging. The issue against suction dredge operations in the streams of the United States appears to be less an issue of environmental protection and more of an issue of certain organized individuals and groups being unwilling to share the outdoors with others without like interests. Management of the Fortymile River region (a beautiful, wild and scenic river in the remote part of east-central Alaska) and its resources is complex due to the many diverse land-use options. Small-scale, family-owned gold mining has been active on the Fortymile since the “gold rush” days of the late 1880’s. However, in 1980, the Fortymile River and many of its tributaries received Wild and Scenic River status. Because of this status, mining along the river must compete with recreational usage such as rafting, canoeing, and fishing. Lewis, 1962. Results of Gold Suction Dredge Investigation. Memorandum of September 17, 1962. California Department of Fish and Game, Sacramento, CA. North, P.A., 1993. A review of the regulations and literature regarding the environmental impacts of suction gold dredging. U.S. Environmental Protection Agency, Region 10, Alaska Operations Office. EP 1.2: G 55/993.